4" Aluminum Expansion Box for 4" Extruders. Cast Aluminum. Output dimension 61/2 inches by 61/2 inches. Made in the U.S.A.
4" Expansion Box Slab Die Kit for 4" Extruders. Cast aluminum expansion box die kit for slabs. It will produce a 6" diameter round tube with a wall thickness of 3/8" or 1/2". To layout an 18" slab, cut tube down one side of the tube. Use of this Die Kit requires the 4" Aluminum Expansion Box. Made in the U.S.A.
4" Expansion Box Wooden Die Kit for 4" Extruders. Marine grade plywood inner and outer dies to make circle, square, and hexagonal shapes. Extrusion wall thickness 1/2". The Wooden Dies will produce 6" diameter extrusions. 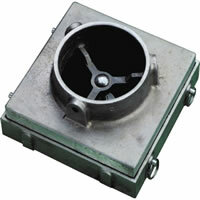 Use of this Die Kit requires the 4" Aluminum Expansion Box. Made in the U.S.A.